no lifting or handling problems here!! 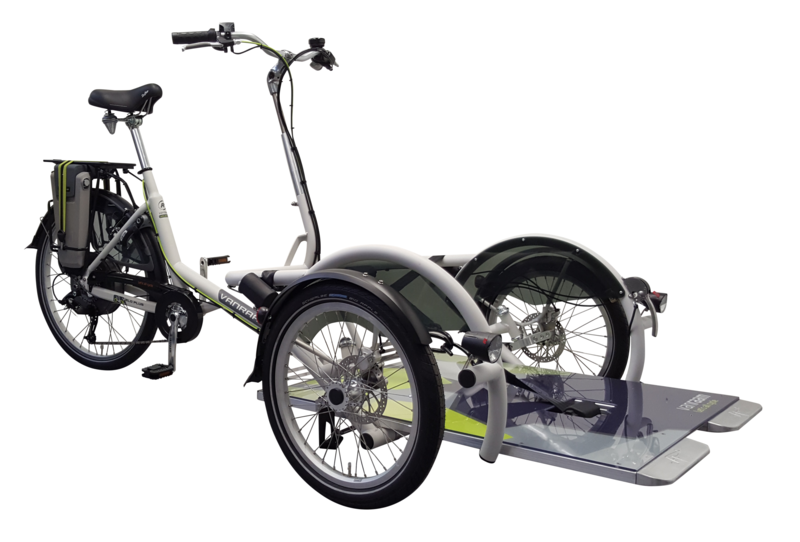 The Velo Plus is a special needs trike otherwise known as a wheelchair transporter bike for wheelchair users to enjoy a bicycle ride whilst still remaining in their own chair. With its unique accelerated steering system making it extremely manoeuvrable the Velo plus wheelchair transporter is the solution! Even if your passenger has a complex seating system in their own wheelchair that would normally make transferring impossible or weight problems making transferring difficult. Group use - so quick and easy - for everyone to enjoy the wheelchair transporter bicycle, regardless of age or disability. Simply click and allow the platform front down...reverse passenger on,the platform clicks back up, safely strap in with 2 rear and 1 front clamping points, plus overall strap...and off you go! Optional extras include: split frame, crank shortners.